The rumour mill in the automotive industry is constantly turning, and this time it has been turning its attentions to the Mazda MX-5. This little sports car is a really fun car to drive and has been in production by the Japanese car manufacturer since 1989. Known as the Mazda MX-5 Miata in the United States, the MX-5 is available in both coupe and roadster formats. It’s about as practical as trying to transport a 3-seater sofa on top of a shopping trolley, but then the car wasn’t designed with practicality in mind (if that’s what you’re after, consider getting something like the CX-5 compact crossover SUV instead)! 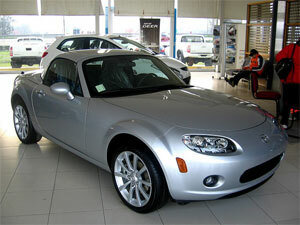 At present, the MX-5 is in its third generation and is codenamed “NC”. This current generation has been in production since 2005, with a couple of facelifts in 2008 and 2013 respectively. But what is interesting is that a newer fourth-generation MX-5 (the “ND”) is due to be in production in the very near future, in an apparent joint alliance with Fiat. Apparently, a new rear-wheel drive roadster will be developed for both the Mazda and Alfa Romeo marques in 2016, although the engines used in them will be derived from the ones used by each manufacturer. The new model is due to be built at Mazda’s Hiroshima plant in Japan. A not-so-subtle hint that the fourth-generation Mazda MX-5 will be utilising the company’s SKYACTIV technology was found at the 2014 New York International Auto Show. It was the first time the motoring press have been able to feast their eyes on the new SKYACTIV roadster chassis, and points to the obvious conclusion that the new Mazda MX-5 will be taking advantage of the firm’s performance-enhancing and fuel-saving technologies in the 2016 release of the new model. In case you weren’t aware of this already, SKYACTIV is Mazda’s umbrella term for its range of performance-enhancing and fuel-saving engine, transmission and chassis technologies. A number of petrol and diesel SKYACTIV engines have been developed with a high compression ratio of 14:0:1 (yes – even the petrol engines!) which allow consumers to fill up with their favourite low-octane unleaded and diesel fuels without suffering the effects of engine knock. The transmissions have been designed from the ground up for sleeker shifts and lower transmission losses, and the chassis and bodies of SKYACTIV cars have been designed to be 100 kilograms lighter than their predecessors without affecting strength. The Mazda MX-5 is a sports car, and technically it doesn’t matter if a sports car has a small or large engine as long as the desired performance is available to the driver (see the full car spec at Lodge Garage Mazda if you want to know the full spec of the current generation MX-5). If Mazda can make the chassis lighter without losing rigidity, and yet have a smaller output engine and matching transmission that can still deliver the same overall performance as seen in the current generation MX-5 models, this will greatly appeal to present and future MX-5 drivers.